"You need a teacher! I can show you the ways of the Force!" Way of the Force has now been available for Star Wars™: Destiny for a couple of weeks, and we've seen plenty of exciting new decks rising to the fore at every level of play. Now as we look forward to the North American Championships at Gen Con Indy 2018 and a good overview of the game's top new deck designs, there's still plenty of time left to explore the set's myriad possibilities. There are already strong aggro and combo decks making waves in the community, and as we see some of these newer decks rise to prominence, we're bound to see others designed to counter them. So what sort of deck might rise to conquer Gen Con Indy? And how would you go about unlocking its potential? 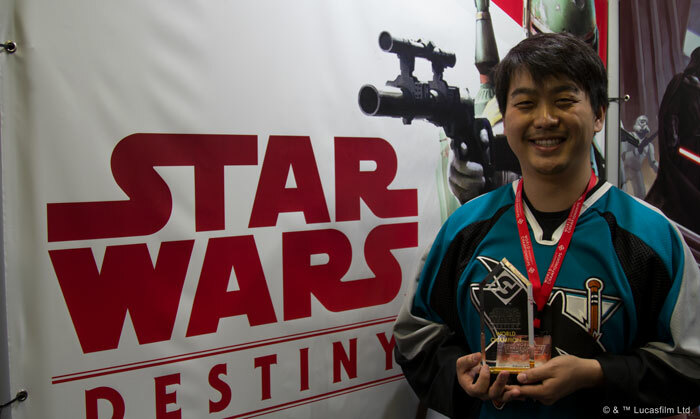 In order to gain insight into the deeper mysteries of deckbuilding, we turned to the game's 2018 World Champion, Edwin Chen! 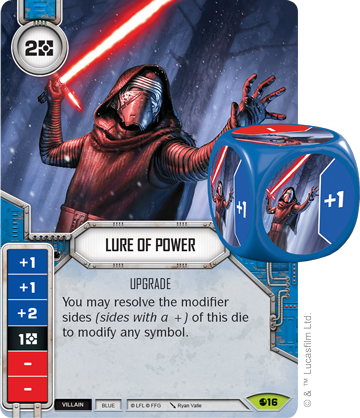 Since Way of the Force released, many of you have been excited to explore all kinds of crazy and cool new decks, especially in the competitive scene. Because of the flurry of deck designs that follow, the releases of new expansions are always an exciting time, but evaluating all the new cards can also be a bit overwhelming. Today, I want to share my approach to evaluating new cards and constructing decks. Hopefully, some of you out there find this useful! The main thing to look for in a character is consistency. 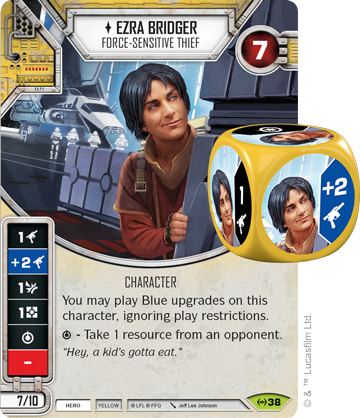 You want characters that will consistently provide results that you’re happy with—via their dice, unique abilities, or characteristics. 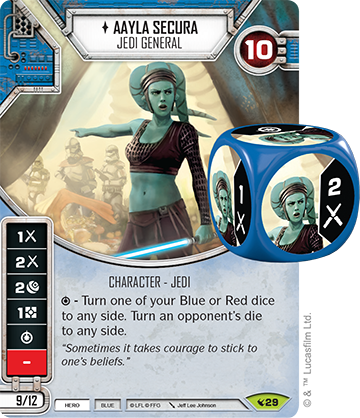 For example, a character like Arihnda Pryce (Way of the Force, 18) is highly valued based off the strength of her dice. She has a great two-melee damage side and two very strong special sides. Based off those faces, fifty percent of her potential results are very strong. 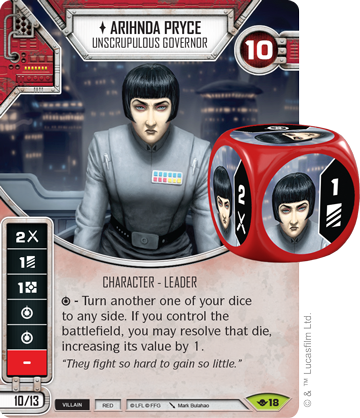 Combine those faces with the always-relevant resource and discard, and you see how Arihnda Pryce offers a die that produces positive outcomes the vast majority of the time. There are also many great characters that don’t have the strongest dice but are popular due to their abilities, especially with the introduction of Power Actions. Let’s take a look at Snoke (Way of the Force, 4). Snoke doesn’t have the best die; his only strong side is a two-focus. 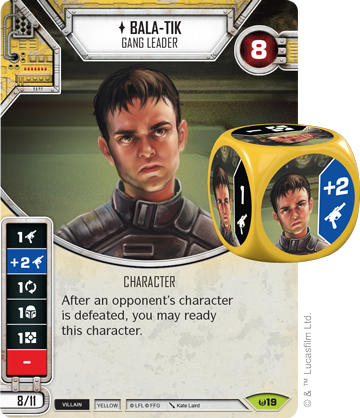 Nonetheless, he's already seeing a great deal of play due to his ability—which ends up being similar to an extra die like that from Lure of Power (Spirit of Rebellion, 16). 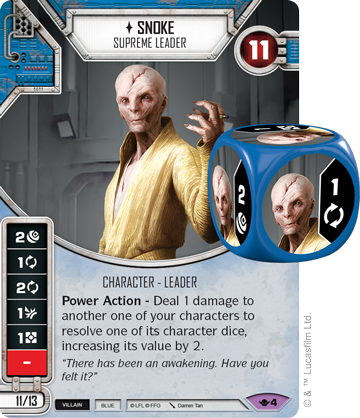 Lure of Power saw some fringe play when Spirit of the Rebellion came out, but in Snoke, we get the better part of this two-cost upgrade for free—at the cost of the damage that Snoke’s ability inflicts. And that creates some serious value. In addition, both of these characters have a relatively low cost. Both are elite at just thirteen points, and that makes them more valuable due to the flexibility they offer. They can fit in a wide range of decks with other powerful characters, or even two or more partners. This is why characters like Ezra Bridger (Empire at War, 38), Bala-Tik (Awakenings, 19), and Aayla Secura (Legacies, 29) are extremely popular compared to more expensive characters like Obi-Wan Kenobi (Legacies, 32) and Sabine Wren (Empire at War, 40), who are often left with only one or two options for a partner. How you evaluate non-character dice cards depends largely on the type of deck you are running. When you're building a deck with multiple low-cost characters, you want cards that keep their value even when characters start dropping. 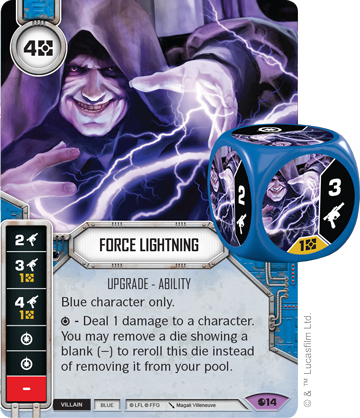 You don’t want to equip upgrades like Force Lightning (Spirit of Rebellion, 14) only to lose it after one use because the attached character dies. On the other hand, once a Vehicle or Redeploy weapon is played, that card's die will almost always remain in the battlefield for the duration of the game. Similar to characters, the most popular upgrades and supports either have consistent die sides or very strong abilities. As a couple of examples, you have the DH-17 Blaster Pistol (Awakenings, 54), which is extremely popular because it has essentially the same sides as a two-cost weapon but costs only one resource. 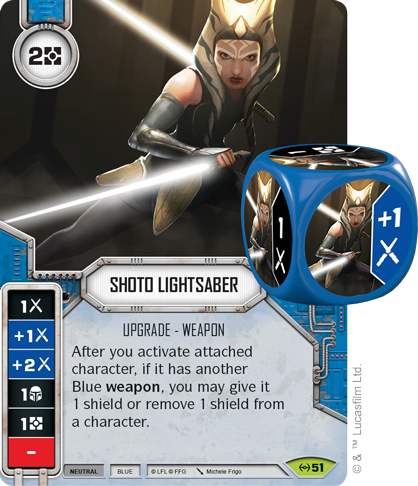 Shoto Lightsaber (Empire at War, 51), on the other hand, has a mediocre die but sees frequent play due to its strong ability. 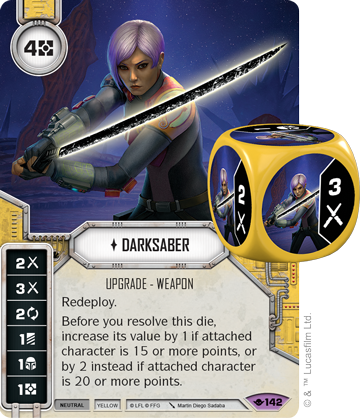 One of the Way of the Force upgrades I’m personally expecting to see much of is Darksaber (Way of the Force, 142), as it combines a strong, effective die with Redeploy. It is also important to note that having more dice in your pool gives you more chances to hit your strongest sides. 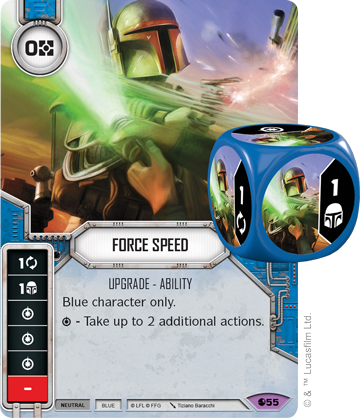 This is why low-cost upgrades like Dark Counsel (Two-Player Game, 6) and Force Speed (Spirit of Rebellion, 55) are frequently played, as they provide extra dice for almost nothing. 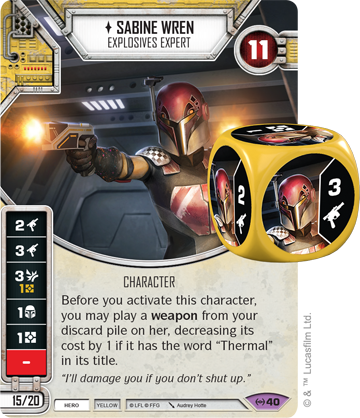 One of the new low-cost dice to look out for is Mandalorian Vambraces (Way of the Force, 143), as this is a one-cost die with no blanks. Most events fall into one of three main categories: removal, ramp, and cheating. A mix of all three categories is essential to every deck, and it’s important to pick out the strongest options of each category if you're looking to construct a competitive deck. 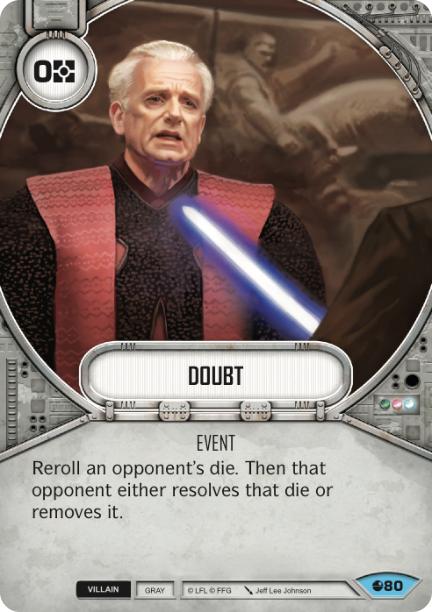 Removal is crucial to every deck, and the past sets have shown that there are two types of removal cards to watch out for—removal cards that cost zero resources like Doubt (Spirit of Rebellion, 80), and cards like Easy Pickings (Legacies, 117) that remove two or more dice. 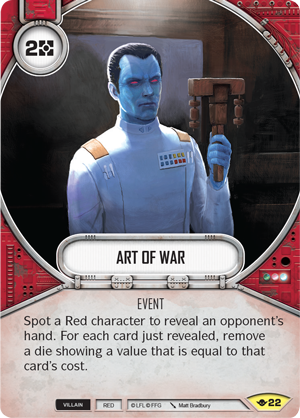 Given this, you want to watch out for new cards like Art of War (Way of the Force, 22) that can potentially blow out a player’s turn by removing all of their dice in the pool. Frequently, the two resources you gain every round aren't enough to finance everything you want to do, so you need cards that generate value to get your engine going. 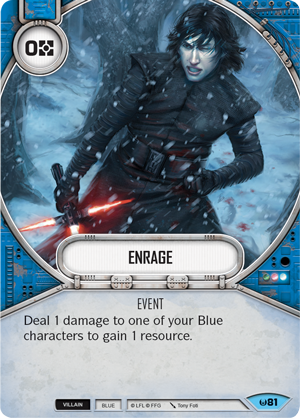 I often value zero-cost cards that provide resources, like Well Connected (Legacies, 157) and Enrage (Awakenings, 81), because resources are key to getting an economic lead against your opponent and winning your games. 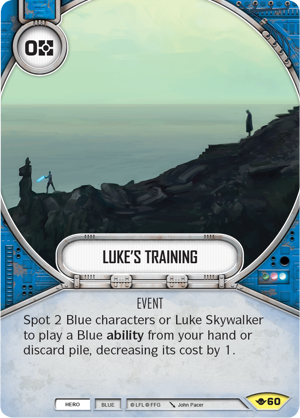 Here, you should watch out for Luke’s Training (Way of the Force, 60), as it not only gives a free discount but is also one of the few cards that interacts with your discard pile. The strongest events in any deck are those that allow you to "cheat." This refers to affecting the game without touching your dice, and it can mean cheating out extra damage, extra actions, or additional health. You will also want events that your opponent isn’t prepared for. 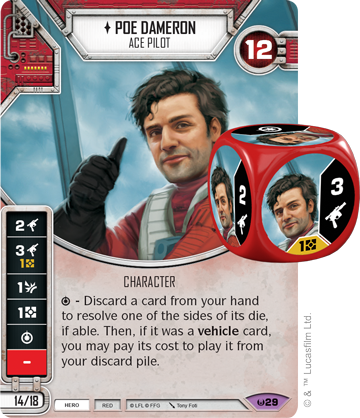 A measly one-melee damage can turn into five with No Mercy (Awakenings, 86) or, in one action, Poe Dameron (Awakenings, 29) could roll out with a Hit and Run (Awakenings, 106) and immediately resolve for six ranged damage. 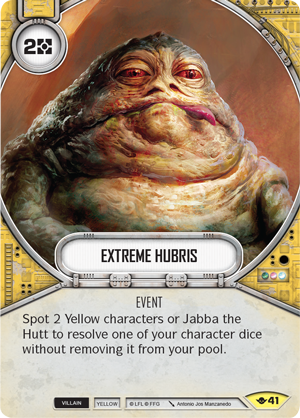 A new card in this category to watch out for is Extreme Hubris (Way of the Force, 41), as this essentially creates and resolves a copy of one of your dice! In summary, these are the things I look for when I'm creating a competitive deck—strong and consistent characters, high value upgrades and supports, and a diverse mix of events. That being said (and as cheesy as it sounds), I still think the most important thing is to build a deck that you’ll enjoy playing. Best of luck building your deck! 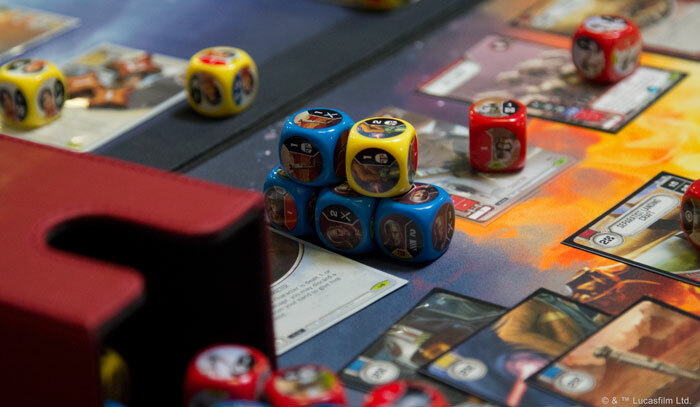 As Edwin suggests, Star Wars: Destiny is a game of tremendous possibility, and each decision you make sends ripples through the Force, impacting each subsequent decision that you face. This is true when you play the game, and it's true when you're building your decks. 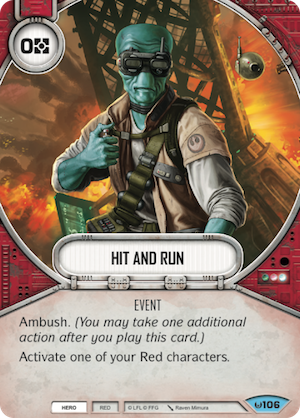 Accordingly, it's hard to make hard-and-fast rules about which action to take, which card to play, which character to target with damage, or which upgrades to add to your deck. Instead, you need guiding principles, and it's hard to imagine any better than those presented by our reigning World Champion. Even so, those guidelines leave plenty of room to explore, discover, imagine, and invent. What will you discover? Will you be the next player to explode the metagame with a surprising new build? Will you be the player to pilot it to competitive success? 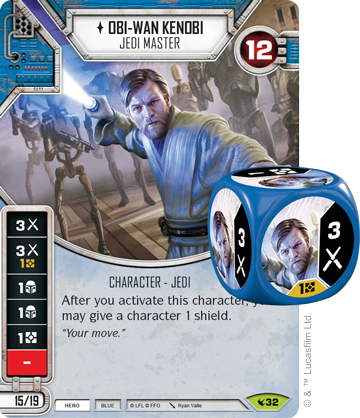 Your destiny awaits you with the Way of the Force Booster Packs and Star Wars: Destiny Organized Play!